Allergic Reaction – Eliminate those Hypersensitivity Symptoms with AllerCease™ – Record 98% Success Rate! 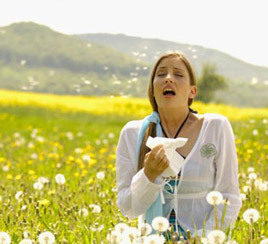 But an allergy can manifest in many other ways and affect a wide variety of organs and tissues in the body. For example, an allergy to calcium can materialize as a failure to grow, or can emerge later in life as osteoporosis, osteoarthritis, kidney stones, and bone spurs. Allergic reactions & Hypersensitivities have many different causes. Weak adrenals, “leaky gut” syndrome, intestinal dysbiosis, chemical exposure,and toxic metal syndromes can all play a role and must be properly addressed for a patient to feel relief. Dr. Cushing is specially trained and highly experienced in correcting all these conditions. Some allergic reactions & hypersensitivity reactions, of course, are genetically inherited. Allergies may also stem from weaknesses in either parent at the time of conception or may be due to the mother’s exposure to various antigens during pregnancy. Such exposure often affects the baby on a cellular/genetic level. Exposures that can weaken a woman during pregnancy include radiation, chemicals, drugs, diseases, toxins, or extreme emotional traumas. No Drugs, Shots, Needles or Supplementation! Over the last thirty years, Dr. Cushing has developed, tested, and finally perfected a clinically safe and effective method of detecting and correcting allergic reactions & hypersenstivity of all types. This ingenious method, called the AllerCease™ technique, has now been tested on thousands of patients nationwide and is carried out without the use of drugs, shots, needles, or supplementation of any kind. Using this revolutionary technique, a patient can now easily be desensitized to virtually anything, including: food allergy, hypersensitivity to sunlight, perfumes, chemicals of all sorts, environmental allergies, plants, animals, antibiotics, vaccinations, metals such as a nickel allergy and even their own body chemicals, hormones, neurotransmitters. Patients with chronic conditions frequently have many fundamental nutrient allergies. When a person has an allergic reaction & hypersensitivity to a vitamin or a mineral (and the associated food sources) it implies that the body is unable to use the nutrient correctly. It actually is processed by the body as a toxin. This leads to a deficiency of the suspected nutrient; and, in some cases, this may contribute to immune weakness. Ingesting vitamin and mineral supplements when there is an underlying allergy to something in them usually causes more harm than good. However, once The AllerCease™ method has cured patients of their basic nutritional allergies, not only are they able to take vitamin/mineral supplementation to their benefit, but these supplements also serving to replenish the deficiencies created by the allergy. During your first visit to our office, based on your symptoms your basic core nutritional factors will be carefully checked. Later, a wide range of other foods, chemicals and biological items will be rapidly tested using the human nerve reflex as an ultra sensitive bio-detector. In this procedure, a specialized neuro-reflex test is quickly performed while the patient holds in his hand a small glass vial containing the allergic substance. If the patient is sensitive to the substance, a tested muscular component immediately loses significant strength or contracts visibly. We have found this very temporary loss of muscular integrity, or contracture, to be a positive and infallible sign of allergic incompatibility. Unlike conventional allergy tests and electro-dermal testing, there are no false positive or negative findings to confuse the issue. The sample can then further tested to determine which organs and other body elements are also affected by the tested item and on what level-physical, nutritional/chemical, or emotional. As an example, many food allergies have a hidden emotional component that once known allows for quick and easy desensitization using E.F.T. (Emotional Freedom Technique). The AllerCease™ neutralizer is a healing device that emits a specialized ‘Chi’-like, vibrational energy using colored light frequencies as carrier waves; however, this is not a laser. It has the capacity to normalize the entire energy field of a patient’s body, including all acupuncture meridians and their sub-channels, in less than 5 minutes. The AllerCease™ neutralizer plays an important role in Dr. Cushing’s highly successful allergic reaction & hypersensitivity desensitzation procedure, and it is so safe that he routinely uses it on babies and infants with absolutely no side effects. The very fine vibrational frequency emitted by this device easily penetrates even heavy clothing so the patients never have to disrobe to be treated with it. The end result is that the specific vibrational frequency of the so-called allergic substance is made to harmonize with and become a part of the optimally normal bio-field of the patient. During this process, the patient is never directly exposed to any harmful substance. After this corrective treatment, the patient must avoid significant contact with the substance for 25 hours. This allows the energy to circulate through each of the 12 major meridians and their sub-channels that regulate all the bodily processes. This 25 hour avoidance strategy effectively “locks in” the treatment and reprograms the body to react normally to future contact with the offending substance. In summary, this treatment allows the vital energy of the body (the “Chi”) to travel in a free flowing path that was not possible during prior exposures to the allergic substance. This is the process that allows the body to relearn how to respond appropriately to the particular allergen, thus sending a clear message to the brain that this substance is no longer a threat because it is now part of the patient’s energy field. Each of the twelve major acupuncture meridians has a peak activity period of approximately two hours out of the day. It is to accommodate the healing of each of these meridians that avoidance is maintained for the full 25 hours. Patients are asked to return to our office within seven days for retesting to ensure that the treatment has been retained. If the allergy has returned (which is a very rare occurrence), it is most often due to the patient’s premature exposure to the offending substance (food, pollen or chemical) before the full 25 hour period has passed. Since we first introduced this advanced technique into our practice, the unprecedented clinical results have been an ongoing source of satisfaction and relief to the thousands of patients we have treated. We now routinely correct allergies to pollen, perfumes, viruses, hormones, and a myriad of other substances; this is accomplished efficiently, effectively, and in most cases, permanently. Our success rate in correcting most allergies and hypersensitivities is well over 98%. Once these abnormal allergic reactions are corrected, we frequently discover that many previously resistant chronic conditions the patient had suffered from resolve with surprising speed. Disorders such as asthma, A.D.D., chronic fatigue syndrome, colitis, eczema/psoriasis, learning and behavioral problems, chronic viral conditions and a wide variety of auto-immune diseases have responded very quickly to the treatment of the underlying (triggering) allergens. This is especially true when any underlying organ or tissue weaknesses are also addressed therapeutically. It is theorized that allergic reactions & hypersensitivities make it impossible for complete tissue healing to take place in these patients. Once the patient has been desensitized, and his/her meridians and nerve pathways completely cleared, deep healing can finally take place in many of these difficult and often so-called “incurable” cases; and, significant stress is removed from the adrenals, liver, stomach, intestines, and respiratory tract. Allergic reaction/hypersensitivity can cause a multitude of baffling and disabling syndromes. It is not at all unusual to find that neither the patient nor the treating physician is aware of the hidden hypersensitivities that are often perpetuating, or even causing, the illness. Many allergy researchers believe that this may well be due to the fact that the concept of “allergy” has been too narrowly and arbitrarily defined in the past. Even if a patient does not break out in hives with contact to the allergen, the triggering substance can play a major role in chronic disorders. Thus, the traditional methods of diagnosis and correction are frequently incomplete and inefficient. Free 15 minutes phone consult with Dr. Cushing! Experience has taught us how to most effectively test for and remove any energy blockages creating an inappropriate, adverse allergic reaction. If you or you friends or families have allergic problems, we look forward to being of genuine service and substantial help. Please feel free to contact us about your condition. There is a free 15 minute phone consultation with Dr. Cushing, and he is always happy to take the necessary time to discuss your health issue with you. “Chronic Colitis. I had chronic colitis causing numerous food allergies. When I came to you I was allergic to many different foods which caused severe gastrointestinal problems. Thanks to you I can eat almost anything without symptoms and I can enjoy my life again. I also appreciate your kindly manner, patience and genuine interest and the extra help you gave me regarding my insomnia, your recommendations for diet and supplements also have been a great benefit to me”. – Barbara M Schueman RN.,BSN.,MA. These are just a few of our testimonials please visit our page for more testimonials.